CDN Print Plastic has been recognized for sales excellence by Pointman USA. 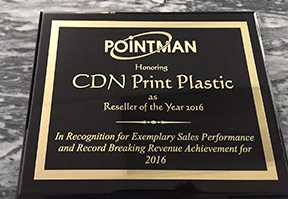 CDN was the top North American reseller of Pointman card printers and supplies in 2016. Zebra Technologies announces a new Channel Partner Program and recertification of all Partners. 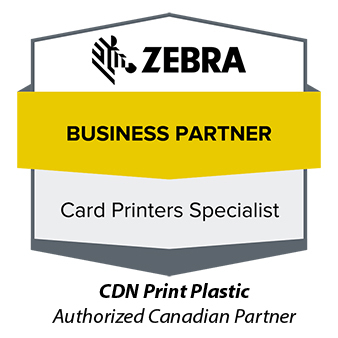 CDN Print Plastic has continued to expand our association with Zebra and has been certified as a Zebra‬ Business Partner - Card Printer Specialist. The Zebra Card Specialist Programme recognises and rewards partners that have the skills andknowledge to confi gure, maintain and support our ZXP Series™ of Card printers. The ZXP Series 7 is a perfect upgrade to anyone who is currently using a P330i or P430i Performance class printer. The ZXP Series 7 offers quite a few advantages over the P330i and P430i. The ZXP Series 7 offers photo-like color images, easier ribbon loading, lower cost per card, holds more cards. The ZXP Series 7 offers a better operational efficiency due to it's high throughput. The ZXP Series 7 card printer is also a great choice for those looking to replace their P630i and P640i Security class printer. The ZXP Series 7 has better operational efficiency, better edge-to-edge photo like color images. You will have a lower cost per card and less media loadings per job since the ZXP Series 7 holds more cars, ribbon and laminate. Ethernet comes standard on all ZXP Series 7 card printers, plus it's adaptable design allow you to enable option upgrades like the laminator. The new Zebra ZXP Series 3 plastic card printers from CDN offers affordable card printing for users with low to medium volume card printing requirements. 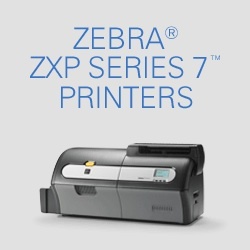 Based on the popular Zebra P110 and P120 series, the ZXP Series 3 offers increased direct to card printing speeds of up to 160 cards per hour, field upgradeable encoding and Ethernet interface options as well as increased security features. The ZXP Series 3 printers are highly versatile and designed with ease of integration in mind - providing flexible connectivity options and an SDK for custom applications, the ZXP Series 3 is the best value in its class for printing and encoding photo ID, access control, gift cards, loyalty cards, membership cards and many other types of plastic cards. The ZXP Series 3 may be compact enough to fit easily on almost any counter space in retail, leisure or hospitality environments, but don’t let the size fool you, it’s packed full of features that really speak for themselves. Offering affordable on demand card printing thanks to either single or dual sided model options; the ZXP Series 3 range offers contact and contactless (MIFARE) encoding and a secure issuance model which is perfect for secure financial cards. Thanks to EMV certified encoding and optional security features, the ZXP Series 3 is one of the only printers in this format that has a fully lockable cabinet enclosure which features not only lockable access to the inside of the printer, but also to the cards in the input hopper. This means that cards can be printed securely in the knowledge that only authorized personnel have access to any sensitive information. All models in the ZXP Series 3 range come with a Kensington lock to secure the printer to any counter top. The ZXP Series 3 printers utilize host based image technology which significantly speeds up card printing time by shifting most of the hard work to the host PC, allowing the card printer to focus on printing the actual card. Thanks to the new and improved Zebra i Series ribbons which have been reformulated to enable high speed printing and high performance, cards printed on the ZXP Series 3 now offer improved durability , increased image quality and a faster throughput. CDN Print Plastic has signed an agreement with Evolis USA to become an Evolis Official Partner. "CDN Print Plastic brings over 24 years of experience in the plastic card industry and is excited to grow our card printer business, and have Evolis as a partner, says William Hay, President of CDN Print Plastic". CDN carries a full line of Evolis card printers and authorized Evolis supplies. We will be under going our certification to become a Evolis card printer repair depot in the coming months. A new great marketing idea and plastic card alternative. Our new mini card keytag combo card can be custom printed and personalized by CDN Print Plastic, or purchase them blank and print them on a Zebra card, Datacard, Evolis or Fargo card printer. A new gift card alternative for: Retail gift cards, Health club cards, Greenhouse / Garden center cards or loyalty, membership or discount cards. ZXP8 - Retransfer Printer, Just released, Nov. 15, 2009. Zebra card launches its, new high quality, near photographic retransfer printer.. This is fastest re-transfer printer on the market, and can be ordered as a single side or dual card printer, USB & Ethernet connectivity standard. "We are excited to be partnered with Zebra Technologies, to launch this NEW Generation of card printers in the Canadian market, says William Hay, President of CDN Print Plastic." CDN Print Plastic will fully stock all ribbons and consumables for the ZXP8 and our card printer service department has already been trained to service and fully support the ZXP8. "We are looking forward to tremendous growth in the re-transfer printer market", says Mr. Hay. ..... Stand tuned for more news. New CDN Print Plastic Zebra card mirosite added. Link to our new Zebra card web site for a list of all Zebra Card models, supplies and driver downloads. Zebra Card released QuickCard ID, March 2009. A complete turnkey photo ID card system. CDN Print Plastic is proud this to our product line. Zebra Card Premier Partner, October 2008. CDN Print Plastic is recertified as a Zebra Card PREMIER PARTNER. Authorized Canadian Zebra card Premier Partner. Zebra Card Printer Certification. CDN Print Plastic obtains its 2008 Canadian Zebra Card printer certification. CDN Print Plastic is a fully authorized Zebra ELITE reseller, as well as ASP certified. Our highly trained in house technicians are factory certified for all Eltron and Zebra card printer repairs, and warranty repairs on all models of card printers. For all your Canadian Zebra card warranty repairs, contact our ASP certified technichians. Jan. 2008 - Fargo HDP 5000. CDN has added to its card printer line, Fargo card printers. The new HDP5000 High Definition printer is an exceptional, low cost, high definition printer. Delivering near photographic quality and over the edge printing. Sales on the HDP5000 have been strong, especially to Governments offering top quality photo ID cards. New Laws in Ontario for Gift cards, effective Oct. 1, 2007. On October 1, 2007, expiry dates and fees will be banned on retail gift cards except for fees to customize a gift card or replace one that has been lost or stolen. Please link to: http://www.gov.on.ca/MGS/en/ConsProt/133716.html for more information and how it can effect you. Design and print your own gift cards on line. CDN Print Plastic has just released our new online Gift card, card builder program. Simply, choose a background image, upload your logo, or type in your text, and leave the rest to us. Canadian made Gift cards, direct from the manufacturer. Start designing - Check out card builder today! Canadian Print Plastic is now a fully authorized reseller for all Datacard printers and embossers. Your new Datacard dealer in Toronto, Canada, and servicing all across Canada. Call us today and check on our special pricing for the Datacard, SP35 and SP55 card printers. These cards let recipients know they are valued and appreciated. With Zebra card printers, customers don’t have to wait for their gift cards. 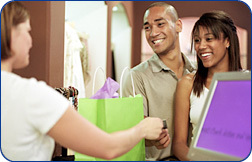 Keep your customers satisfied with personalized gift cards. Contact one our sales representatives to discuss the right printer that suits your needs. Gift Card sales are exploding. Retail stores have been responding to the demands of consumers as sales of gift cards — about $1 billion US when they were introduced south of the border in 1995 — exploded to about $70 billion this year. In Canada, the retail sector is expected to bring in just under $59 billion in 2006 holiday sales, according to a study by accounting firm Ernst and Young. Gift cards will make up a healthy chunk of those sales &8212; in 2005, a study conducted for the Retail Council of Canada said 19 per cent of shoppers would buy gift cards. But, in a news release, the council said that more Canadians would likely shell out for the convenience of not having to search high and low for that special gift. The most successful gift card in North America may be the one offered by Starbucks. The company estimates that 10 per cent of all the caffeine hits served up by its North American baristas is paid for by gift cards. It's also the only retailer that will let you use your gift card to buy a gift card for someone else. About 96 million Starbucks cards have been activated since they were launched in 2001 — and customers have reloaded those cards more than 38 million times. Wal-Mart Canada expects gift card sales to explode as well. The company reports that by the end of November 2006, money loaded on gift cards waiting to be spent increased by 30 per cent over the same period a year earlier. With competition increasing for the gift card dollar, companies are getting more creative in their offerings. Aeroplan is offering $100 and $250 cards that can be redeemed for merchandise in various retail outlets. The cards can be had for either 14,000 or 33,500 Aeroplan miles. The priciest gift card around may be the $100,000 Four Seasons Gift Card. 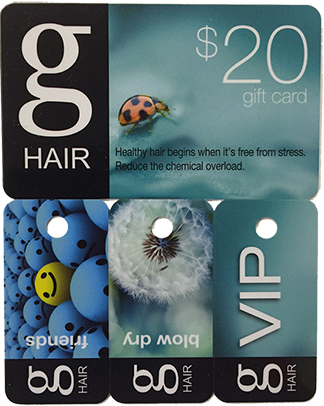 When the chain got into the gift card game in 2005, it was available in denominations up to $1,000. But cards worth $2,500 and $5,000 were quickly added.